I’ve complained about similar offers before, but since this arrived in my inbox this morning, I figured it’s time to revisit the issue. Today’s lesson is about third-party offers, where an outside company pays to get in front of your customer base. They are relatively rare in financial services these days because banks and card issuers are wary of being tarred and feathered in social media (or the CFPB) if something goes wrong or the particular marketing permissions were later shown to be lacking. The offer in question is from Uber. It’s good for $5 off your first 5 rides and requires a Capital One card for payment. That’s a win-win. 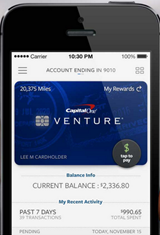 Uber gets a new customer and Capital One gets its card loaded into the Uber app for years to come. The problem: It’s only for new Uber customers. 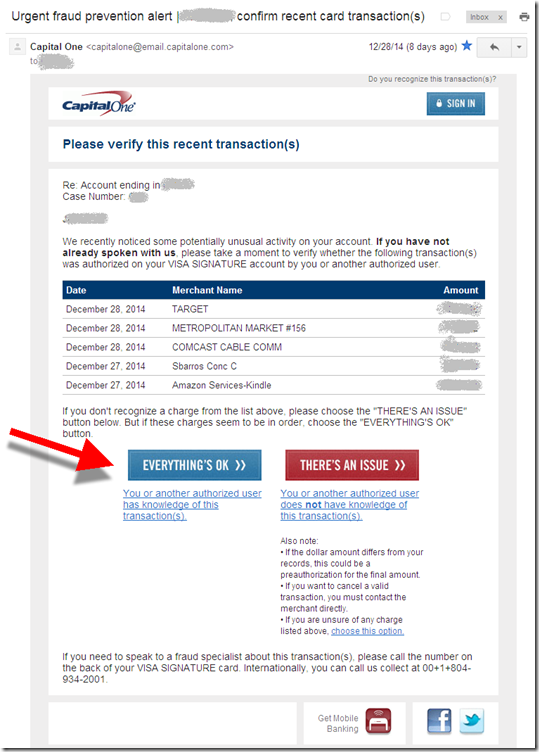 I presume Capital One removes cardholders from the mailing who have charged an Uber to its card. But that doesn’t catch people who use another card in their Uber account. So let’s break down what happens next. 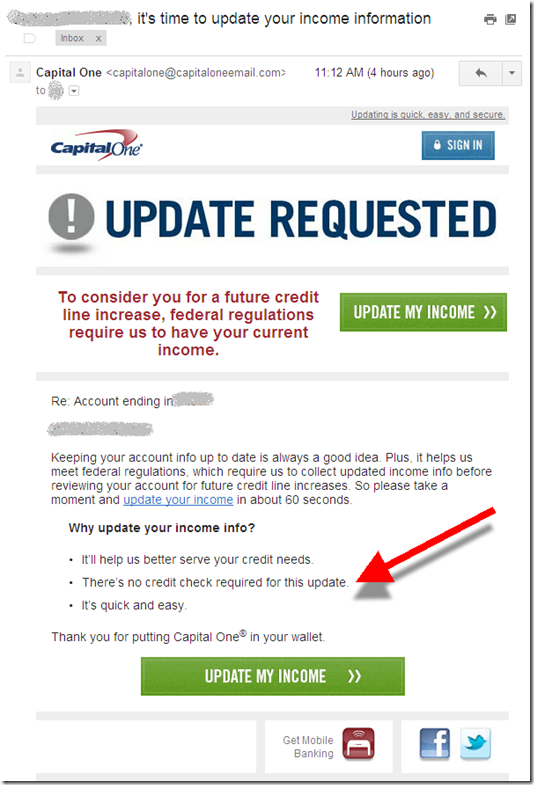 Capital One customers get this slick email (see above). They get excited to switch Uber payments over to their Capital One card to grab some $5-off rides. But then, after reading the fine print, or more likely clicking through the message and trying to sign up, cardholders find out they get zip from this deal. Now, they are not happy with Capital One or Uber. What a waste of time and brand loyalty. Instead, why not give some smaller benefit to existing Uber customers willing to switch their payment card over to Capital One? Even just one $5 off coupon would suffice for most. Bottom line: Capital One needs to earmark a portion of its commissions from Uber towards existing customers. If there isn’t enough revenue to do that, then it should stop making the offer. Related: At last m onth’s Finovate Fall, MX demo’d, and won Best of Show, for an automated solution called Power Switch to automatically enroll your customers’ cards into e-commerce sites such as Uber, Amazon, iTunes, and so on. Get a behind-the-scenes look at how MX produces its award-winning (six consecutive Best of Shows) at FinDEVr in Santa Clara 18/19 Oct 2016 (register here). Recent email marketing research found that two-thirds of Americans regularly check email via smartphone and a significant number of total opens (as high as 70%) are now opened on a mobile device. Since most emails that look good on mobile look fine on a desktop (but NOT vice versa), you can pretty much disregard the desktop when creating a design template for your email alerts and marketing messages. Here’s a few examples from my inbox during the past few weeks. Both Capital One and BBVA’s Simple use appropriate font size and a good mobile layout. Simple does an especially good job at grabbing attention with a small animation at the top of the message. In comparison, the BankDirect pitch is not well optimized for mobile, though it’s readable if you work at it. But it does nothing to grab your attention visually. My inbox is far from normal. With 25 active financial accounts, all set to maximum notifications, I am drowning in email alerts, push notifications and other helpful communications. But who isn’t overloaded with missives from social media, news feeds, spambots and whatever else is competing for your attention. Banks need to help users cut down on the noise, by offering smart alerts that don’t bog you down in trivial details. Not to pick on anyone in particular, because all my providers do pretty much the same thing (with the notable exception of BillGuard), but this alert from Bank of America today (see below) is a good example of info overload. Yes, I’m sure I asked the bank to notify me of any card-not-present transactions. Given the amount of times my card number has been breached in the past five years, it’s a good early warning. But really, do you think it’s necessary to tell me for the 89th consecutive month that you paid my $8.75 Netflix monthly fee? Really, I just want to be informed if it were to suddenly go up or be repeated. 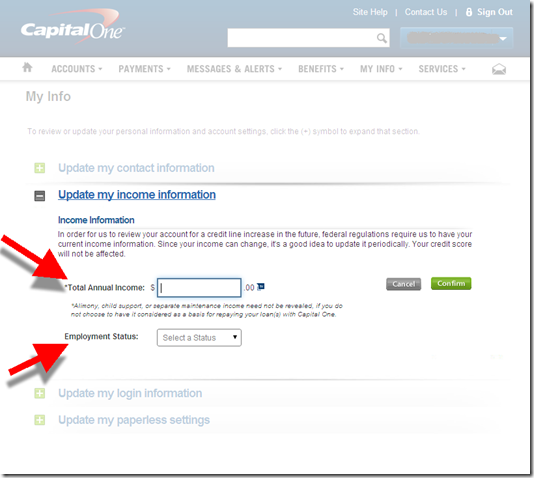 I’ve used Capital One’s credit card fairly actively for the past 4 or 5 years. And they’ve rarely, if ever, declined a charge (and there has never been any fraud on the card). The last fraud message I can find in my email was in December 2011 (see last screenshot). But apparently our travel combined with extra holiday spending finally caused the banks’ fraud system to flag our account, rejecting a $100+ Target purchase a few days after Christmas. I have Capital One’s mobile wallet installed which pushes near-real-time notifications to the lock screen (iOS). I did receive a notice I’d been declined, but no word on why or what to do about it. But luckily the issuer’s email system handled that task admirably. Within a few hours I received an excellent email detailing the five most recent charges, and providing a simple "all clear" button that was clickable within the email, a major improvement over issuers who merely tell you there is suspicious activity and make you call or login to find out the details. This is the best suspicious activity notice I’ve ever received. 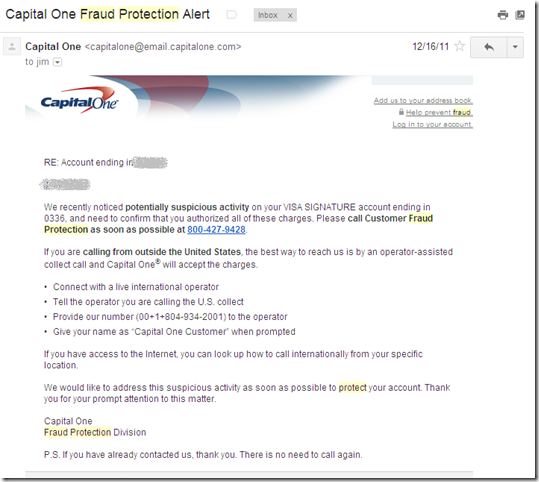 Typically, I receive message similar to Capital One’s "old" version imploring me to call the bank (see last screenshot). However, there is still room for improvement, especially in the reporting process. As much as the fraud folks desire a concrete yes/no answer, the real world is often full of gray areas. In this case, I was sure that I’d make all these transactions, but often that’s not the case. Sometimes you don’t recognize a merchant or your spouse may have made the charge or you simply don’t recognize something you may have authorized a while ago. There needs to be a third option here, "I’m not sure." Furthermore, when faced with a list, users should be able to address each transaction individually. In my case, clearly the Target purchase triggered the red flag. It was a large amount, I rarely shop there, and I’d just flown 2,000 miles from my previous transaction the day before. In reality, the other transactions were pretty meaningless to the fraud detection algorithm. Even if I couldn’t remember one of the previous four routine transactions, Capital One wouldn’t have wanted to shut my account down. They’d already lost a few dollars on the declined Target transaction, there was no reason to compound that loss with costly calls to customer service to vet the other transactions. Finally, I’m not a fan of the web pages presented after clicking on the "Everything’s OK" or "There’s an issue" button (see second and third screenshots). The bank gets points for thanking me for my help, but they forget to apologize for the inconvenience of declining my purchase at Target. It’s pretty embarrassing to be standing at the checkout with a basket full of goods while everyone thinks you are a deadbeat. The webpage responses don’t go very far it telling me what to do next. Even if I’d given the all clear, I still have questions. Which of the transactions, if any, were declined? Will the declined transaction go through now that I’ve said it’s OK? And how can I avoid this in the future. And if I did have issues with one or more of the transactions, the only option is to call the bank, and there isn’t even a number supplied. Aren’t there self-service options at this point that could save everyone some time? I’m always on the lookout for digital process improvements, from the major to the minor. And this one definitely falls in the latter category. But in my 22 years of banking online, I don’t recall ever being prompted to update my income so that my card issuer could reconsider my line size. But that’s exactly what I received this morning. At first blush, it almost sounded like a crafty fraud attempt. But Capital One wisely inserted my full name, the last four digits on the account, and promised to handle it in just 60 seconds (see first screenshot), so I’m pretty sure it’s legit. They also reassured me that it won’t require a credit bureau inquiry. Clicking through the email places the cardholder onto the normal online banking login screen. 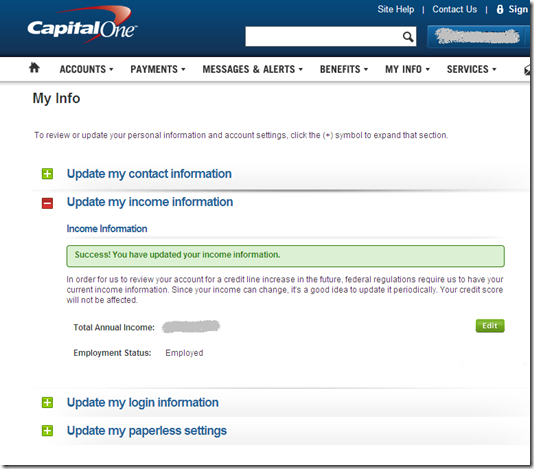 After logging in, you are sent directly to an account-update page (screenshot 2) to update income and employments status. After completing the two fields, you are thanked and can navigate to other areas or logout (screenshot 3). Total time expended = 87 seconds (Internet times were a little sluggish late afternoon on the West Coast). Thoughts: This card dates back to 2010, so it’s possible they are on a four-year cycle to update income information; however, I just sent my W2 to Capital One two days ago for a mortgage refinance. So I have to believe this email was triggered by that; if so, it demonstrates solid CRM integration, although it seems curious that the bank wouldn’t just pull my income directly from the mortgage app. All in all it was a painless experience, and I look forward to seeing whether the bank uses it to alter my credit line. 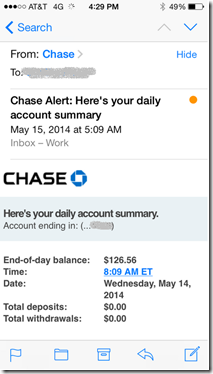 UI: Chase Bank Remodels the All-Important "Account Summary Alert"
Here at Netbanker/OBR, we love to write about the digital future. But we know it’s even more important to address the digital now. If you don’t leverage current technology to your advantage, the future doesn’t much matter, since someone else will be running your business. Today’s topic, one that we used to harp on constantly, is alerts (see previous “Alerts” posts). Alerts are the way you maintain the relationship with customers between logins. But too many banks and credit unions take email alerts for granted, and are still using a template from 2004! Those templates were created prior to webmail, and, more importantly, before mobile viewership skyrocketed. One bank whose messaging template was too long in the tooth is Chase (it’s looked the same since at least 2010; see note 1). But as part of their continued digital remodeling, the bank changed it last week. It’s not going to be confused with Simple or Mint, but it communicates the important information efficiently. And that’s enough for most brands. All the information is lined up on the left side so it can be easily read on any screen size; this is especially important on mobile which was previously impossible to read (on iPhone) without pinching and zooming. Got rid of the Go Paperless! banner. Talk about banner fatigue. I understand that it’s a great benefit to convert users to paperless, but really, four-plus years with the same banner? MIX IT UP, please! Changed headline to position “Chase” as the first word instead of the last. 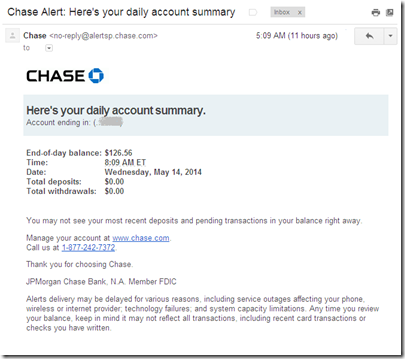 That helps users scanning subject lines see that it’s from their bank. Added light blue background at top to give it a better look. Cleaned up the data table for better readability. Made the website URL more visible. Added more fine print and caveats (the only item that is a step backwards). 1. 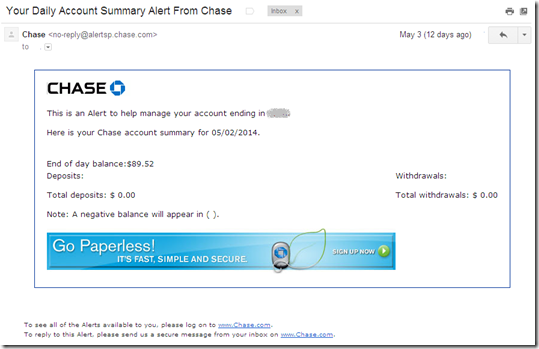 The UI described here is for a Chase checking account in Washington State (converted from WAMU). 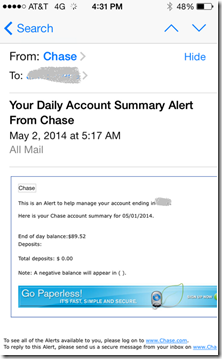 This email alert template may be different in other regions or for other account types. 2. For more info on alerts and messaging, see our 2010 Online Banking Report (subscription). Despite more holiday hate over surge pricing, Uber is one of the more high-profile up-and-coming digital brands in the world. 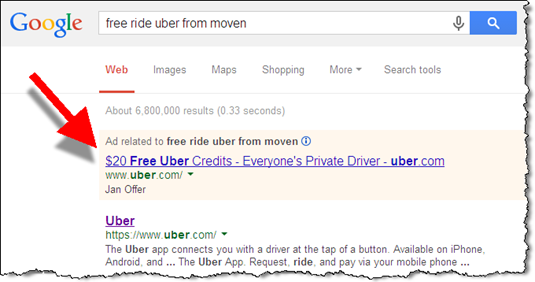 As the new year dawned (3 Jan 2014), Moven ran an eye-catching promo offering a free Uber ride (up to $30). I flagged the email because I thought it was a great activation move. Moven appeared to be offering me $30 to get moving and complete my new account authentication (note 1). And more importantly, to get my Moven card in play in an app that offers a future stream of interchange revenues. But unfortunately, the offer is limited to new Uber customers only (disclosed in small type at the bottom, that’s my red arrow in the inset). And surprisingly, it appears that you can enter any credit/debit card number into the signup form as it’s not Moven-specific. 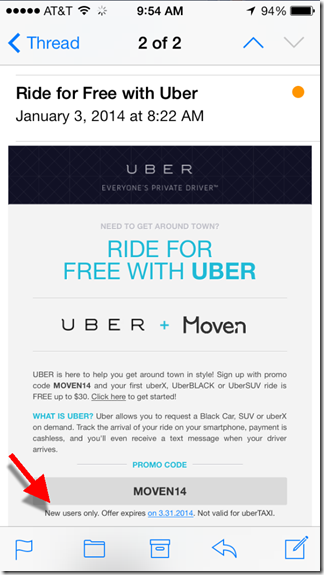 Good: Free Uber ride is cool and valuable and a good company to associate with the Moven brand. The $30 offer beats what Uber served me on a Google search by $10 (see second screenshot below). Bad: A significant number of those interested in the offer will already be Uber customers and unable to participate (note 2). 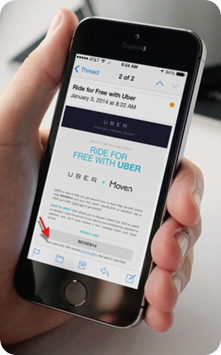 Good: Encourages users to enter their Moven card number into the Uber app. Bad: The form, and offer, can be used with any credit/debit card. Fix: Require the ride be charged to the Moven card to qualify for the free credit. Good: The email design was attractive and easy to read in a desktop browser window. Bad: Headlines were good, but copy and fine print were not readable on a mobile (iPhone 5) without zooming (see inset above). Bottom line: Despite these drawbacks, it’s still a good promo. And its cost to Moven is likely zero (note 3), a very important factor for a startup. So I’d rate it a B+ overall in terms of execution, but an A for value (to Moven), assuming Uber picked up the tab. 1. I signed up as soon as I got a Moven invite, but I got caught in the authentication loop, still needing to find those trial deposit-amounts and feed that to Moven. 2. Also the fine print says “new users only.” Originally, I took this to mean “new Moven users” since the message came from Moven, and I was new to Moven and not new to Uber. 3. It’s highly likely there was no cost to Moven, and it’s possible the startup is earning a commission for each new Uber customer. There are a number of financial startups and trail-blazing FIs bringing modern user interfaces to banking. We see dozens of great examples at every Finovate (note 1). And we expect a slew of remodels in the new year as responsive design and other techniques take hold. 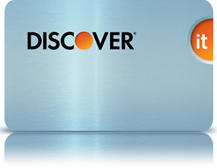 But I continue to call out Discover’s design work (previous posts). Partly because I have an account there and see it often and partly because it’s instructive to see how a large full-service bank handles design tradeoffs. 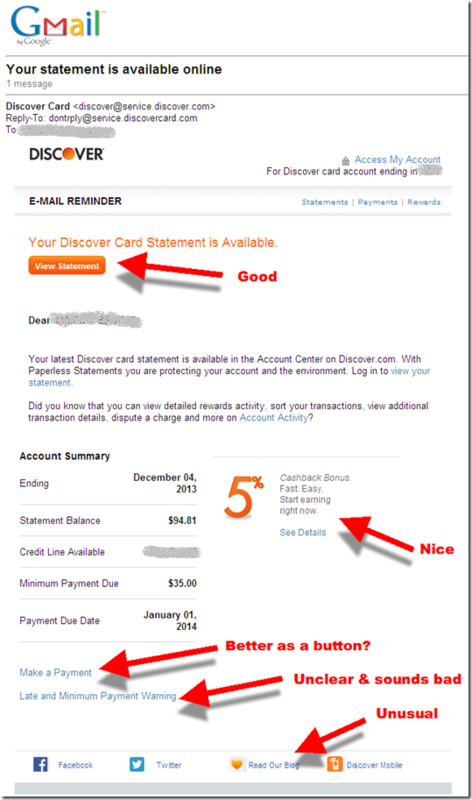 Yesterday’s email from DIscover, reminding me that my monthly statement was ready, shows how the card giant marries good design with useful information. The company includes a button to view the statement at the top, but somewhat buries the payment link near the bottom. Include a Pay Now button. Remind me that I’m on autopay and when to expect the payment in full to be deducted from my bank account. Reword and fix the bottom link. Currently it says “Late and Minimum Payment Warning.” That sounds like there must be a problem with my account. But there isn’t, so I assume that is supposed to link to the alerts maintenance area. However, that link wasn’t working, so I just was dumped onto the main secure account page. It was very confusing. Add a link to customer service, both self-serve and human powered. Add the amount of rewards earned this period. It’s always nice to be reminded of free money received. 1. For example, a recent crowd favorites was from Poland’s mBank which demoed alongside Accenture at FinovateFall in September (demo video). As a long-time student of the black art of marketing, I knew that I’d be in for some tricks and treats from Simple. And my first marketing message from the startup did not disappoint. Have you been cheating on us? So you’ve deposited money into Simple, and you’ve swiped a few times, maybe paid a bill. Not to get all clingy, but what’s up? 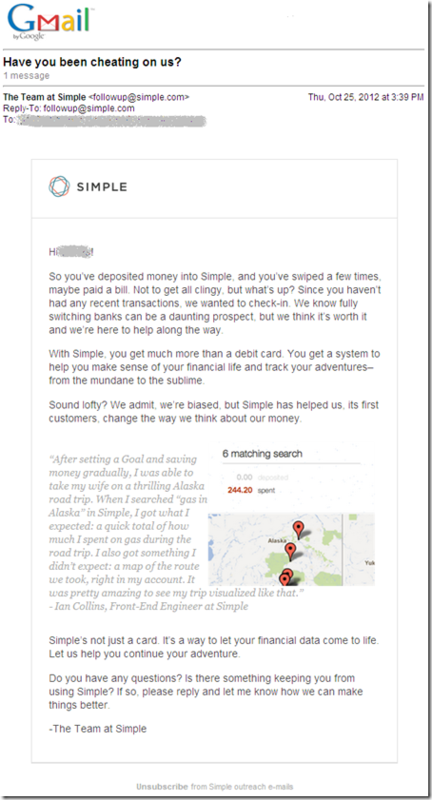 The email (below) goes on to make the case for switching to Simple including a testimonial centering on the startup’s spending map. Brilliant.